"Plic Ploc", Cirque Plume’s latest creation is good to the last drop. "Were you there?" risks being THE question of the summer of 2004 in Montpellier. It is even highly probable that this same question may persist for a number of years because going to see a performance of Plic Ploc, Cirque Plume’s latest creation, showers, rinses, washes and finally drowns all our senses in pleasure. It’s crazy what an effect a simple drop of water, dripping on the corner of a stage, can have. A cleaning clown hurriedly neglects to wipe up the puddle, whereby facilitating the birth of the music of life: in an enamel pot or in a field of metronomes budding with flowers that give the show rhythm, in a mirror-like puddle suitable for wading, with jets of water that let the good times escape in short bursts. It doesn’t take us long to figure out that all of these water sagas and little drops of pleasure will culminate in a large river of emotions. Water and life are a well-known refrain, and at Cirque Plume, when the subject concerns life and love, it flows straight from the source. Poetic, funny and acrobatic, the sketches in Plic Ploc flow and juggle with light and music in order to play with illusion and plunge the spectator into the circus arts revisited. With them, "everything is possible", as Bernard Kudlak, around whom the creation was constructed, likes to say. Everything, especially metaphor. The show actually took root three years ago in New York. The dog days of summer in an air-conditioned tent around the date that the president of the United States refused to sign the Kyoto Accord conceived to fight if the air-conditioning in the tent took its turn malfunctioning? Is proposing real water (glug glug, waterfalls, games…) leaks on a stage like swimming against the tide? 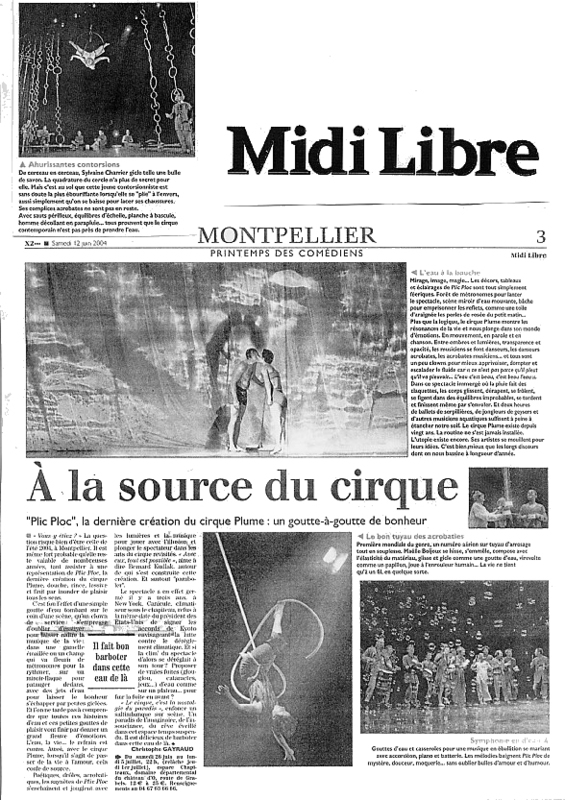 "Circus is the nostalgia for paradise", declares a perforr on the stage. It’s an imaginary, trouble-free paradise - a waking-dream in a space where time has been suspended. How delectable it is to splash around in that water.